Frank Sanchez wasted about 15 minutes Friday night waiting for ringside technicians to put the ring back together between the first and second rounds of his televised fight. Once the action resumed, the unbeaten Cuban heavyweight wasted no time whatsoever getting rid of Willie Jake Jr. 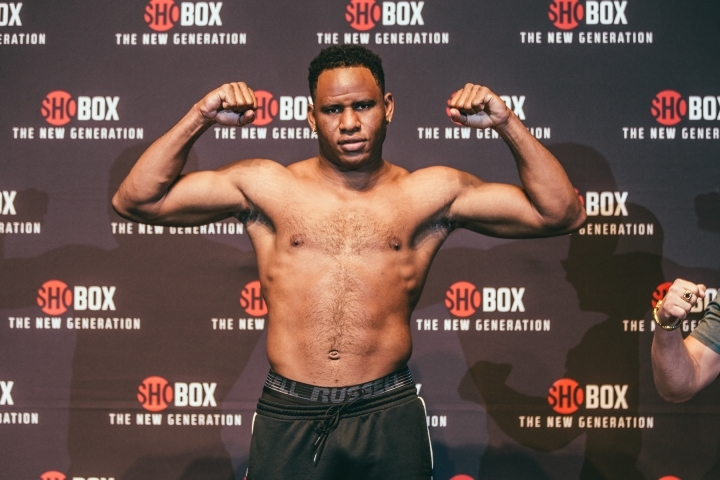 The taller, stronger Sanchez knocked out Jake late in the second round of their scheduled eight-rounder in Shreveport, Louisiana. The 26-year-old Sanchez (11-0, 9 KOs, 1 NC), a Las Vegas resident, knocked down Jake late in the second round. Referee Bruce McDaniel stopped their fight with one second remaining in the second round. Indianapolis’ Jake, 35, lost by knockout for the second time in his three-year pro career (8-1-1, 2 KOs). Showtime televised Sanchez’s victory as part of “ShoBox: The New Generation” tripleheader from StageWorks in Shreveport, Louisiana. After the first round ended, the second rope from the top of the ring collapsed. Ringside technicians tightened it eventually, but the mishap caused roughly a 15-minute delay between the first and second rounds. Sanchez began dominating the action once the second round began. He hit Jake, whose back was against the ropes, with an overhand right that buckled his legs when there were 22 seconds to go in the second round. Another right hand by Sanchez appeared to hit Jake with much less force with just under 10 seconds remaining in the second round, but Jake went down. Jake was motionless, face-down on the canvas. McDaniel quickly stopped the fight once he realized Jake couldn’t continue. Sanchez landed the cleaner, harder shots during the first round as well. His best shot of the round, a short right hand, connected with about 1:25 to go in the first round.